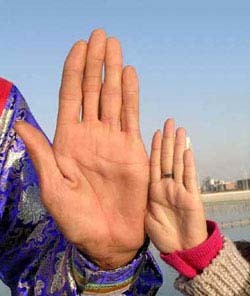 World's Largest Living Hand: Sultan Kösen, Guinness World Record since 2009! Sultan Kösen has officially the world's largest living hand since 2009! On 25 August 2009 Guinness World Records announced that Sultan Kösen from Turkey to be the world's tallest living man; Kösen also holds the current Guinness record for the largest hands, which was measured at 27.5 cm. However, until august 24, 2014 Kösen's status for the world's largest living hand has been disputed by a man from Ukraine: Leonid Stadnyk (5 August 1970 - 24 August 2014) - the details of his claim are reported in the article belows. however, Robert Wadlow (US) had the largest recorded hand ever! Leonid Stadnyk is the tallest man in the world, his living hand is 31 centimeters long. 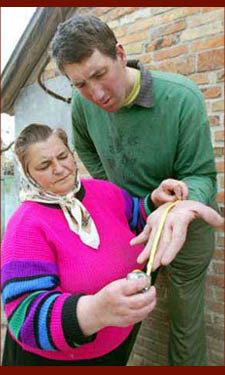 Leonid Ivanovyc Stadnyk from Ukraïne is the world's tallest living man according to Guinness World Records 2008. Leonid Stadnyk's excessive growth began after brain surgery when he was 14 years old. He developed a pituitary gland tumor which caused the gland to secrete large amounts of growth hormone, resulting in what doctors describe as acromegalic gigantism. On August 8, 2007, Guinness book's spokeswoman Amarilis Espinoza stated that in the 2008 edition of the record book, Mr Stadnyk at 2.59m (8 feet, 5 inches), replaces Bao Xishun, a native of Inner Mongolia in China who stands 2.36 m.
Leonid has the biggest palm in the world as well - his palm is 31 centimeters long. Probably for this reason he does not drink alcohol: any glass looks tiny to him. Leonid Stadnyk with his father. TIP: You can take a look at Leonid's hand via this wonderfull Leonid Stadnik Youtube video - featured with Michael Buble singing: "You give your hand to me ..."
However, 24 year old macrodactyly patient Liu Hua from Jiangsu (China) is the man who used to have the world's largest human hand ever! On July 20, 2007 doctors removed 5.1kg of flesh and bone during a surgery procedure. When Liu was hospitalized in Shanghai, his left thumb measured 26 centimeters, his index finger was 30cm and his middle finger 15cm. The overall weight of his left arm was about 10 kilograms. The tallest person in medical history is Robert Wadlow (February 22, 1918 - July 15, 1940), who suffered on hypertrophy of his pituitary gland which results in an abnormally high level of human growth hormone. 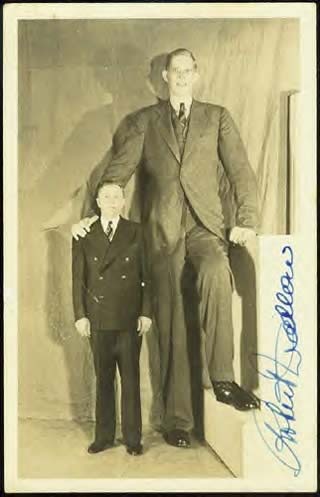 Wadlow reached 2.72 m (8 feet 11.1 inches) in height. Robert Wadlow's hands measured 32.4 cm (12.75 inches) from the wrist to the tip of the middle finger. Photo & video: Robert Wadlow and his family. Guinness World Records has returned the title of world's tallest man to China's Bao Xishun after Ukrainian Leonid Stadnyk refused to be measured under new guidelines, Reuters reports. Bao, who stands 7 feet, 8.95 inches, held the title for a year before losing it in 2006 to Stadnyk, who is 8-5&half;. Bao agreed to be measured by Guinness - six times in one day, standing and lying down - but Stadnyk refused, saying he didn't want to be bothered. Previously, a doctor's statement was enough to give the nod to Stadnyk. Guinness added the measuring stipulation this year to tighten its requirements. Ukrainian Olena Stadnyk (L) measures the hand of her son Leonid Stadnyk in the yard of their house in the Podolyantsi village in Ukraine's Zhytomyr region - about 200 km (124 miles) from the capital city Kiev. 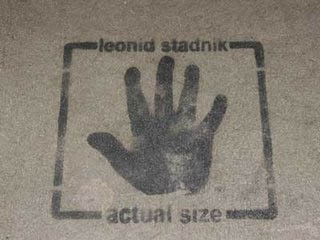 Leonid Stadnyk's hand measures 31 cm. hand on the train platform at Paoli. 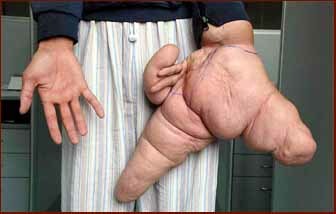 Leonid Stadnyk's left hand measured by his mother: approximately 31cm. The large hands of Zhao Liang - the new 'tallest man'?